Many of us are familiar with Chinese style food, whether it is authentic or adapted. However, Chinese eating customs are very particular to their culture. In China, meal times tend to vary by region and class. However, it is most common for families to gather for meals three times per day. Much of Chinese family life is central to their eating tables. Unlike in Western culture, it is not as common to differentiate between the types of food served for each meal of the day. They serve the same food regardless of the time of day. Sometimes laborers will only eat two meals a day and then have three smaller meals at tea houses. The Chinese generally do not drink when they eat. They drink tea throughout the day, but there is usually not even water on the table during meals. At family events or special occasions there may be wine or liquor to accompany dinner. Soup is usually the only liquid on the table, and the Chinese use it to wash down food. Dessert usually is not served with a meal, and sweet foods are usually reserved for special events, and eaten between meals rather than after. Dairy is also not usually found in Chinese food. Meals revolve around the fan, which means grain. Rice is more common in Southern China and in urban areas. Wheat and wheat products like grains, noodles and bread are more common in Northern China. Both of these products are considered expensive. Lower classes stick to less pricey grains, such as millet, corn or sorghum. 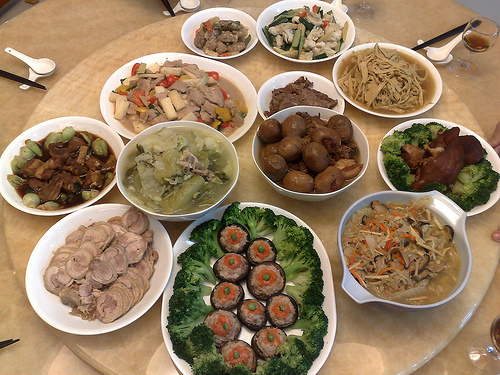 The Chinese often consider meats and vegetables as side products of the main grain ingredient. At the table, each person will usually have a bowl of fan, chopsticks, a spoon and a saucer. The saucer is used to place animal bones or shells, or to rest food on that is too big to eat all at once. Meat and vegetable dishes are all laid out in the center of the table, and everyone eats from these bowls directly with their own chopsticks. Chinese tables are generally square or round shaped so that everyone is equal distance from the center. Soup is also eaten communally from a common bowl. Napkins are not typically used during the meal, but people use hot towels following their meals to wipe their face and hands. In general, the most senior person sitting at the table will initiate eating. It comes from the Confucian principal of respect of elders. It is required that you finish all of your fan, as it considered disrespectful to leave any over. This article is a complete waste of time. Ive lived in China for nearly 15 years now and while most of this is correct, some of it is not. You have also missed some fundamental aspects to eating in China such as toasting (Ganbei)etc.